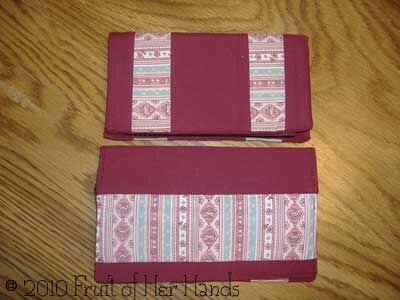 Lately I’ve blogged about my sewing projects, so I thought I’d share some pictures of the finished projects. 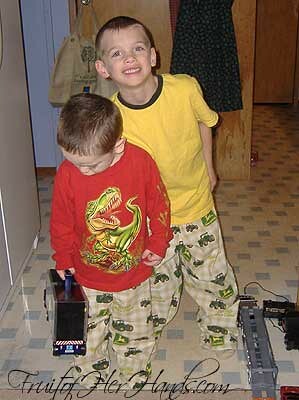 The boys loved their new John Deere pajama pants. Caleb’s fit him, but weren’t nearly as long as I expected them to be. He’s grown more in height than I realized. 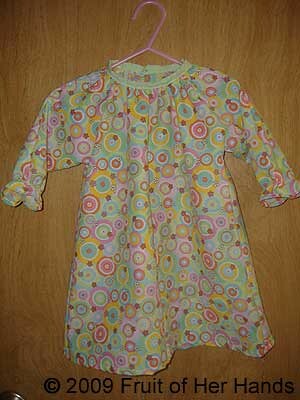 Anna’s pajamas were a ton of fun to make. 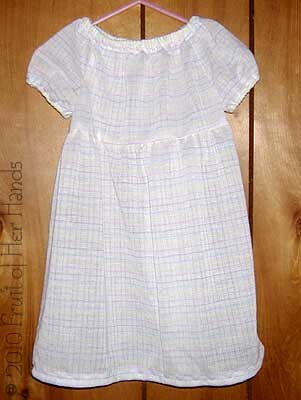 The nightgown is from the indietutes peasant blouse tutorial here. I lengthened the sleeves and gathered them, and lengthened the hem and flared it (a fairly wide a-line shape). 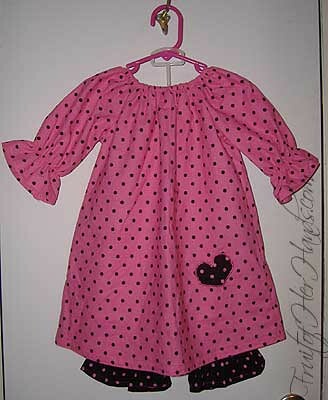 The bloomers are from a regular pant pattern, and gathered at the ankles. I measured her inseam several times but still managed to make them too long. We have to roll them up at the waist right now but at least they’ll fit for a while. Here’s a better picture of the pajamas. I appliqued a little heart on the bottom too. Of all the pajamas I’ve made the kids, these are by far my favorite. 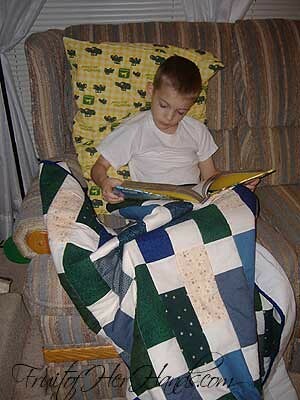 The boys absolutely loved their quilts. 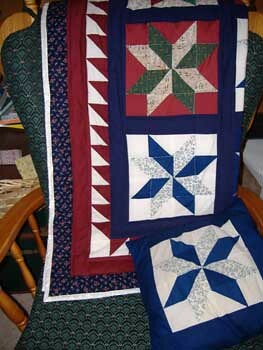 To quilt them, I just stitched in the ditch along each row. I was able to get a walking foot locally, and that made things SO MUCH easier. Saturday was one of those rare days when I was actually able to get some sewing done. 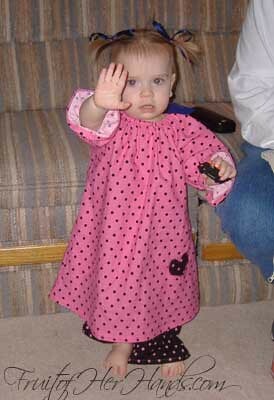 First, I made Anna a new gown. Her pajamas are too warm for summer and she’s about to outgrow them anyway. The fabric is a very delicate knit with pastel stripes – Stephen’s grandma gave it to me not long ago specifically for Anna. 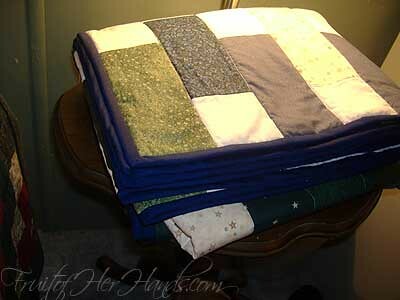 Later I was able to start some pillow shams. The throw pillows on our couch are starting to look awful. I figured some new covers would be enough, rather than completely replacing the pillows. Here’s what I have done so far. 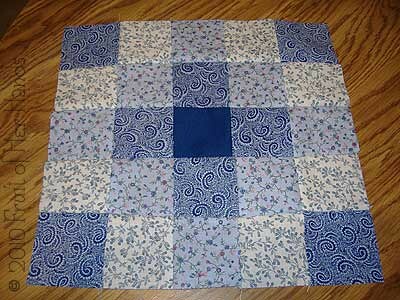 They need a border before I actually make them into shams, but at least I was able to get a little bit done. 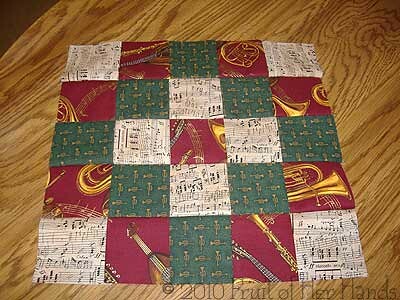 This one I used all the music-themed fabrics. This one is my favorite. It’s quite a bit busier than I realized when I laid out the squares, but that’s ok. One day I’d like to make a quilt out of only blues and whites. . .I think that would be so pretty. 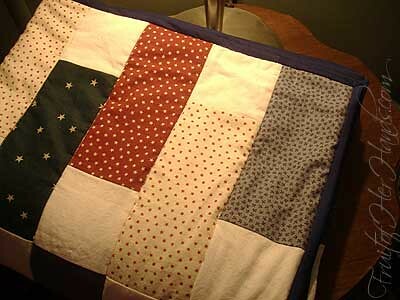 Instead of cutting any new fabric (or scraps, for that matter), I used squares left over from the first quilt I ever made. 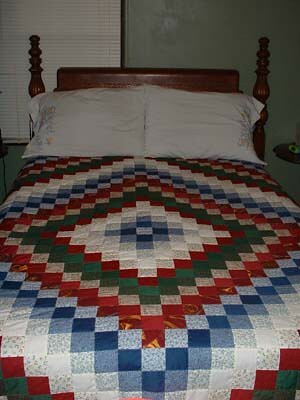 I couldn’t find where I’d shared a picture of the quilt here before, so here’s a picture I took of it years ago. It’s funny how many different projects I’ve made out of those squares. There’s quite a few more left too, but I don’t have specific plans for them yet. Samuel and I made this Names of Jesus Easter garland yesterday. I enjoyed having ours up at Christmas because it was such a reminder of who God is and why He sent His Son here. 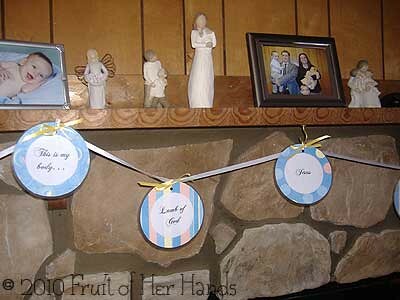 I’m hoping this Easter garland is as much a reminder as the Christmas one was. 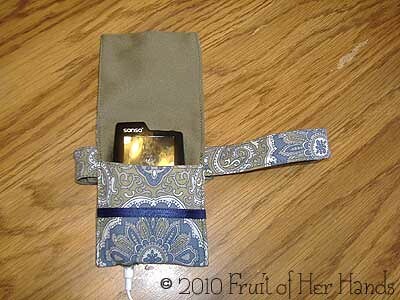 Not too long ago I made an armband for my mp3 player so that I could work out without the cord getting in my way as much. 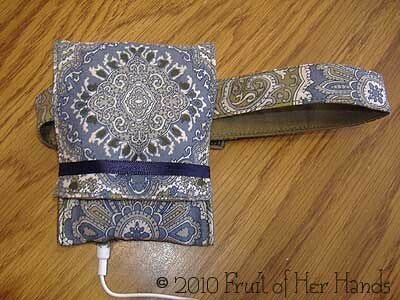 I followed this ipod case tutorial for the pouch and added a removable velcro band to the back. The idea is great, but it needs work yet. The band won’t stay on my arm well enough, even if I turn it to where the player is facing in toward my arm. I’m thinking an elastic band would work better. Also, the ribbon closure looks great, but doesn’t really stay closed. That’s probably more where it’s placed though. I’ll probably add a small piece of velcro there too. Overall, I like it. It’s cute. But it could be better too. Making a new bouncy seat cover has been on my sewing list for quite a while, but it took me long enough to get to actually making a new one. Then it took me even longer to post about it – it’s been done since right after Christmas. Here’s the old cover. Notice the seam at the top is ripping. 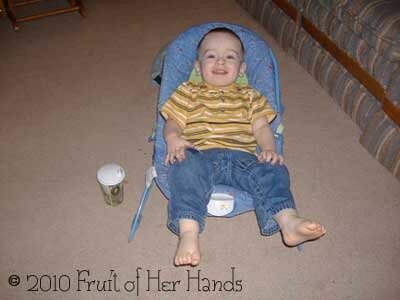 It’s easy enough to keep the baby out of it, but Caleb kept sitting in it. It’s like he thinks it’s his own personal papasan chair or something. What I did was trace around it onto the fabric. It’s some sort of twill – I’m really not sure where it came from. It doesn’t look so shiny in real life, but in pictures it sure does. I didn’t try to add any padding to it just to keep it simple. 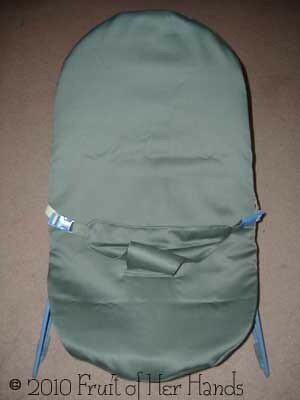 The webbing on the straps was salvaged from what was on the original cover. It was ok for a while, but then one strap started to ravel. Walmart had some though so fixing the strap was pretty easy. 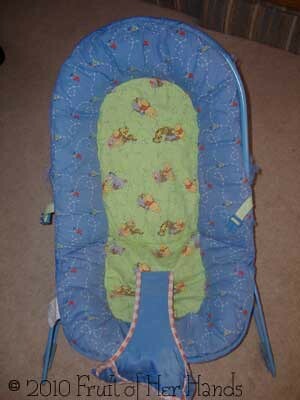 It’s nice to have the bouncy seat in good condition again. Anna loves sitting up where she can watch us, and I like having my hands free more often. Since this cover is made out of much thicker fabric (and double layers at that), I don’t worry so much when Caleb sits in it either. I’ve mentioned before that we use the cash envelope system for budgeting some of our expenses. 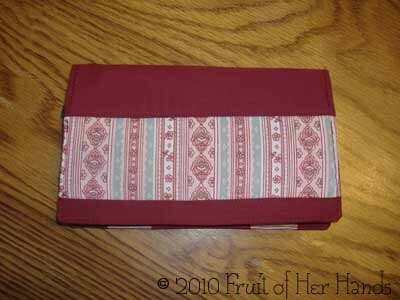 First, I made some zippered envelopes. They worked well, but since they aren’t labeled they’re too easy to mix up inside the store. What’s the use of making three separate transactions if you pay out of the wrong envelope? Then I came across this cash envelope tutorial. It looked simple enough, so I decided to just try to figure it out on my own. 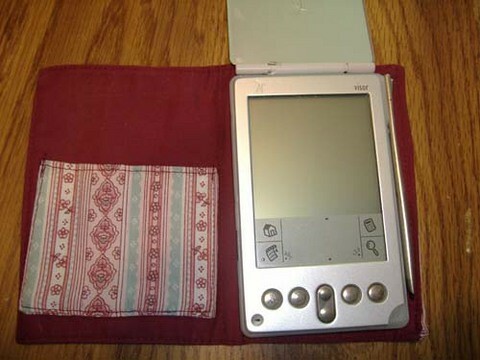 I didn’t want the pockets divided though – I prefer to pull out only what cash is necessary when it’s time to pay for something. 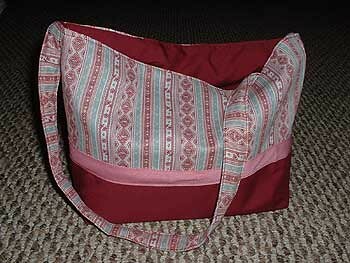 It took me a while to plan out, and there are a couple things I’d do differently if I ever sew another one. I’m pleased with the result though. 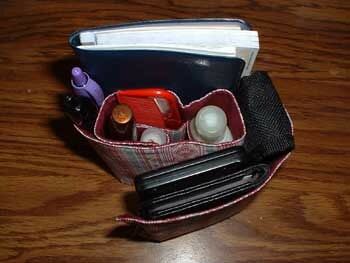 The zippered pocket isn’t lined (one of the things I’d change next time) but seems the right size for spare change. It also matches my checkbook cover. 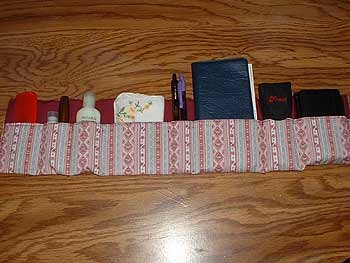 . .
And my purse organizer. 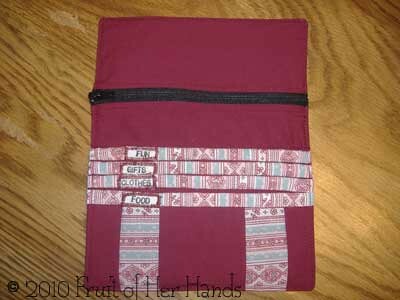 . .
Ok, so it’s a bit much of all the matching things, but I really like the pink and burgundy combination. 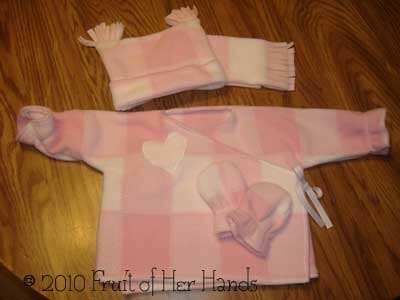 Matching jacket (kimono-style), hat, scarf, and mittens. No pattern, just guesswork. The hat is a little snug but overall it’s a good fit. 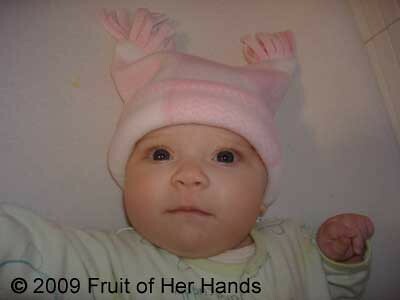 We’re driving to Michigan next week, and Anna needed a warm hat. It was a perfect excuse to use my new sewing machine (which surprised me by arriving on Christmas Eve!). We weren’t planning on going, but God provided the money for us to go in a rather unexpected way. We’re thankful, and really excited to be able to go! 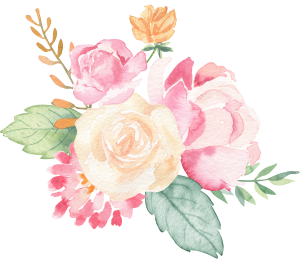 Wow – it certainly wasn’t my intent to quit posting so much. I’ve been busy crafting, and it’s been fun. Every year, our nieces and nephews get pajama bottoms from us for Christmas. Well, actually our entire immediate family gets new pajamas – we open ours on Christmas Eve and then sleep in them that night. It’s a lot of fun. It also means that I’ve had 9 sets of pajama bottoms to sew. Samuel helped me pick the fabric out this year. It’s kept me busy, to say the least. I’ve also been doing a LOT of digital scrapbooking lately too. Last year we gave our parents a “starter” scrapbook of the past year. This year they’ll be getting more pages for their books (I can say that here because neither set of parents reads my blog, lol). I quit scrapping for a while because we don’t have a good place for me to leave a project for very long. Then I discovered digital scrapping, and I’m back at it. I can do nicer layouts in a fraction of the time I could do before, and I can save them midway through if I need to stop. It’s wonderful! Caleb just ran over to me with his fingers on his lips to tell me to hush. Guess I’m typing too loud. Silly boy! Jewelry orders have kept me pretty busy too, but I’m so thankful for that! 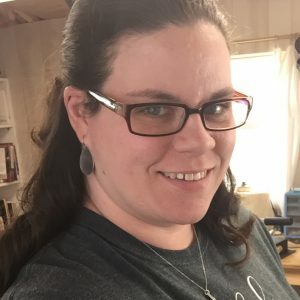 The jewelry is so fun to make, and the income is a big help too. I’m working on a butterfly necklace and bracelet for a friend’s little girl right now – hopefully it turns out as cute as it is in my mind! My mom and Stephen’s mom’s bracelets both need birthstones added too. Samuel has also been helping me make Names of Jesus garlands for Christmas gifts. I made one a couple weeks ago (the picture at the top of the post), and I love having the reminder of the real reason of Christmas hanging in my living room! 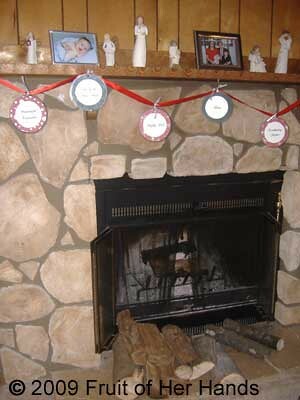 There’s a tutorial to make the garland at The Homespun Heart. She also has instructions for one for Easter too. Hopefully as projects get completed things will slow down around here, but at least it’s been enjoyable! This dress is my latest experiment. I love how it looks on her, but the pattern only has short sleeves. I lengthened them and gathered them to make a ruffle. It turned out great! The only thing I plan to change is to make the neck a little looser. It’s fine now, but there’s not grow room in it like there is in the rest of the dress. Its a great prototype for her Thanksgiving dress!